This is an exciting time in salmon recovery. After more than a decade implementing habitat protection and restoration projects in the Lake Washington/Cedar/Sammamish Watershed (a.k.a. Water Resource Inventory Area, or WRIA 8), our partners have accomplished much and have learned many lessons along the way. Since 2006, over 85 projects have been completed, and another 90 projects are being implemented or advancing toward implementation. In that time, we have guided the investment of nearly $11.3 million in state and federal funding and over $13.4 million in local funding. What's more, we have many committed partners who have invested significant additional funding and resources to support recovery of Chinook salmon. After 10 years we can report progress on many of our ambitious 10-year goals for Chinook salmon in our watershed. The number of juvenile Chinook produced in our watershed per returning adult has increased dramatically in recent years, exceeding our 10-year goals. The number of adult Chinook salmon returning to the watershed, while highly variable, is on an upward trend. This is encouraging. But we are still falling short of some near-term goals, and overall salmon population numbers are still far short of a level that would consistently support sustainable populations year-to-year and fulfill treaty-guaranteed tribal fishing rights. We are moving in the right direction, but there is still much to do. We continually track and monitor our watershed's salmon populations and our progress implementing habitat protection and restoration projects. This allows us to see what is working and enables us to hone our strategies and priorities. Moving forward, we can build on progress to date, but we also know that our ability to recover salmon faces significant challenges. Limited funding and the capacity of partners to develop projects continue to inhibit progress. Our watershed is the most populous in the state and our region one of the fastest growing in the country, putting pressure on areas important to healthy salmon runs. 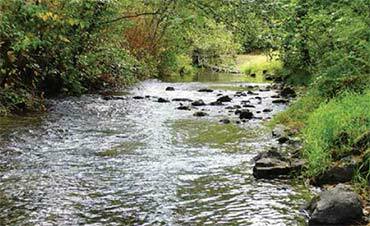 Land use decisions made here will determine whether we can protect and restore salmon habitat. WRIA 8 partners have a unique opportunity to raise public awareness about the importance of salmon recovery, but we will face a tremendous challenge in maintaining political will and public support for salmon recovery as our population grows. WRIA 8 is a leader in salmon recovery, and a regional model for collaborative, shared, and coordinated planning and implementation. Since 2000, members of the WRIA 8 Salmon Recovery Council, and its supporting staff and committees, have worked to ensure our watershed remains a quintessentially Northwest place where salmon return each fall—a place where salmon and people can live together. Trying to bring Chinook and other salmon back to harvestable levels in our urbanized watershed requires both optimism and resolve. In 2015, recognizing the habitat protection and restoration progress made over the past decade, the resulting benefits to local communities, and the efficiency of working together, 28 local government partners in the watershed recommitted to coordinated salmon recovery for another 10 years. In 2016, WRIA 8 will update its Chinook Salmon Conservation Plan, incorporating new scientific information and lessons learned from over a decade of implementation. People and salmon have interacted in this watershed for thousands of years. If we lose salmon in our local streams and rivers, we lose a part of what makes us Northwesterners. Salmon have shown they are resilient and adaptable. We must continue to adapt as well to give them a fighting chance.